Ignoring safety reports, oil train industry tries to roll regulators. What happened here is that the American Petroleum Institute and the Association of American Railroads met privately with federal regulators to offer this proposal in lieu of more stringent safety rules, such as those recommended by the National Transportation Safety Board. Keep in mind that the DOT-111 tank cars in question are notoriously and obviously unsafe. Four times in the last year they have derailed and unleashed towering infernos, killing 47 people in one case. Yet the industry wants to keep them rolling on a daily basis through the heart of big cities, past major league baseball games, schools, cruise ship terminals, you name it. Even though these shipments expose taxpayers to enormous liability risks because the industry is radically under-insured against catastrophic accidents. But big industry players—railroads and oil companies alike—oppose removing legacy DOT-111s from service because doing so might burst the Bakken shale oil bubble. Worse yet, even the overlong three year plan the industry proposes is probably little more than a smokescreen because even that schedule contains a poisonous caveat that tank car manufacturers be able to produce enough tank cars. Yet there’s very good reason to think that they can’t. In fact, industry representatives have already warned “that the railway supply industry will have a hard time meeting the rising demand for new cars while retrofitting existing ones,” and shippers looking to buy rail cars are already facing a two-year backlog in some markets. The details of the plan are troubling too. Among other elements, the industry favors tank cars with thinner steel shells than what the National Transportation Safety Board has recommended, apparently to reduce costs. If regulators at the US Transportation Department go along, the deal would represent an unscientific approach that compromises safety to gain industry approval. 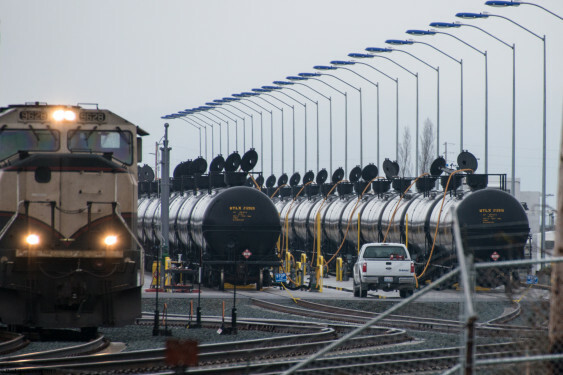 “Our members own or lease the lion’s share of rail tank cars used to transport crude oil,” said Rebecca Adler, a spokeswoman for the [American Fuel & Petrochemical Manufacturers]. As citizens, are we just helpless in this? It seems like there are few avenues for us to weigh in on the issue, and then its only “public opinion” which apparently doesn’t matter to the rail companies one iota. What progress can actually be made when our regulatory systems are so easily manipulated by closed-door deals? After reading the 41 articles on this issue, I want to pretend it’s not happening, to stop reading and thinking about it because all it does it make me feel powerless to make safe choices for myself and my family. Banging my head on my desk week after week is really starting to hurt. I’m beginning to understand why activists have had to resort to property damage and strategic demolition throughout history. I know the feeling, Christin. But take heart. Thanks to Kelly Powers for supporting a sustainable Northwest.